As you wander from the Coliseum to the Palatine, the logical next step is to make your way down the hill through the Roman Forum. The Roman Forum (Latin: Forum Romanum), sometimes known by its original Latin name, is located between the Palatine hill and the Capitoline hill of the city of Rome. It is the central area around which the ancient Roman civilization developed. Citizens referred to the location as the “Forum Magnum” or just the “Forum”. 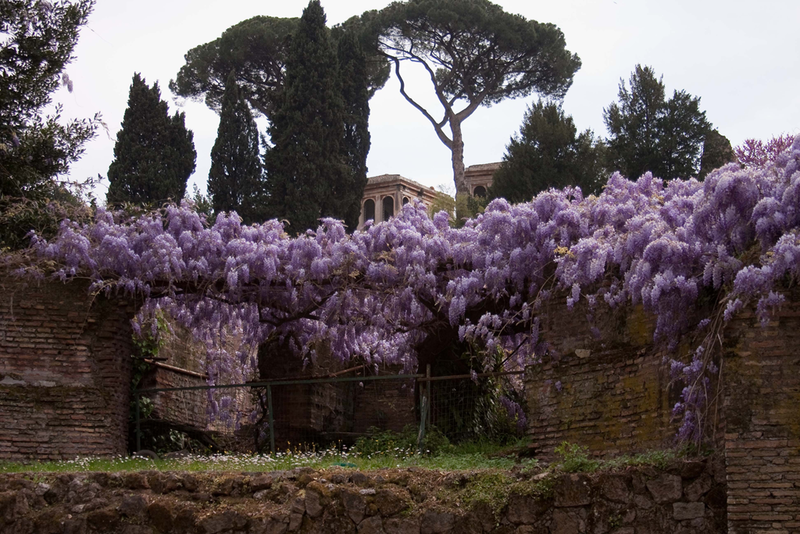 The oldest and most important structures of the ancient city are located in the forum, including its ancient former royal residency, the Regia, and the surrounding complex of the Vestal virgins. 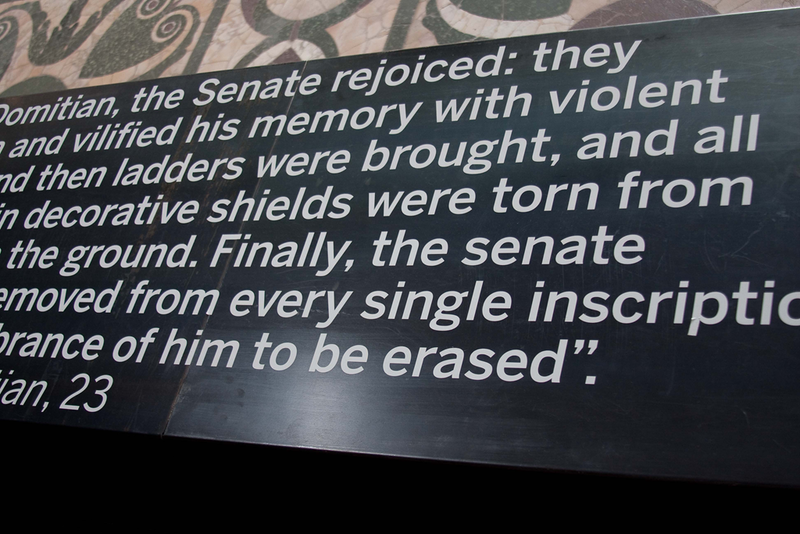 The Old Republic had its formal Comitium there where the senate, as well as Republican government began. 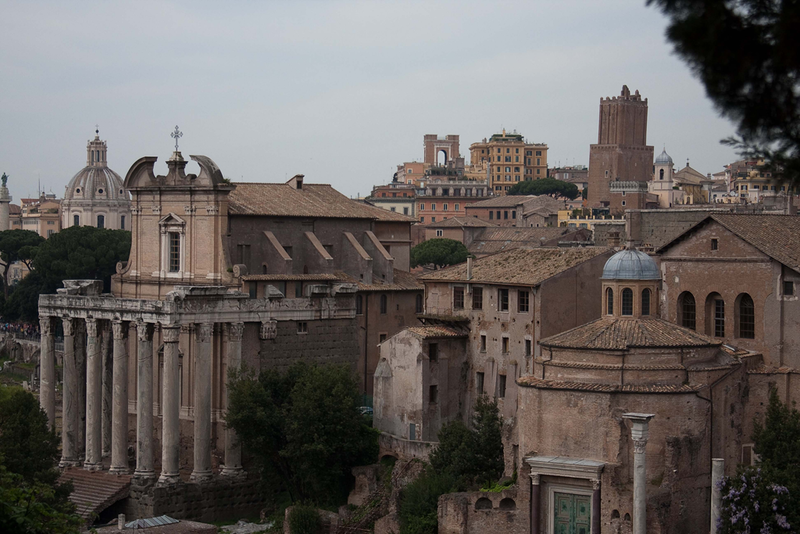 The forum served as a city square and central hub where the people of Rome gathered for justice, and faith. The forum was also the economic hub of the city and considered to be the center of the Republic and Empire. … the Forum was a chaotic place, with food stalls and brothels as well as temples and the Senate House. The view looking down on the Forum …. 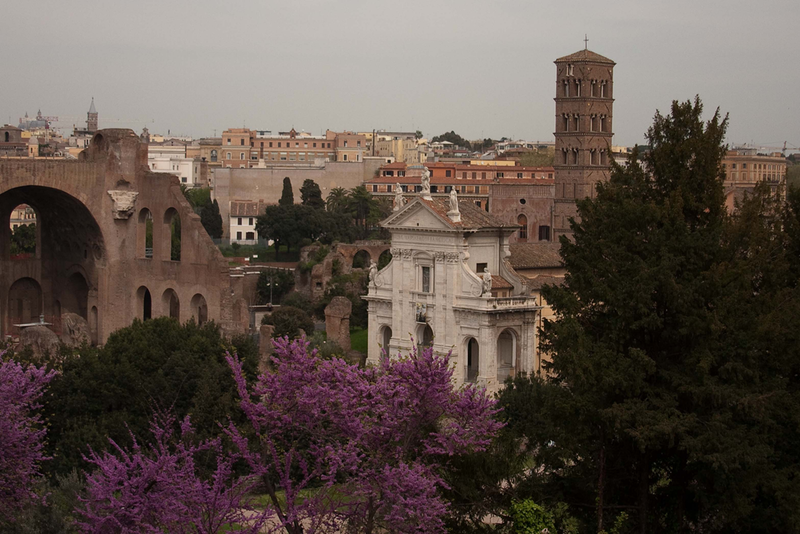 The Basilica of Constantine and Marxentius is on the left with the Santa Francesca Romana bell tower on the right (One of the many churches built on top of the ruins). 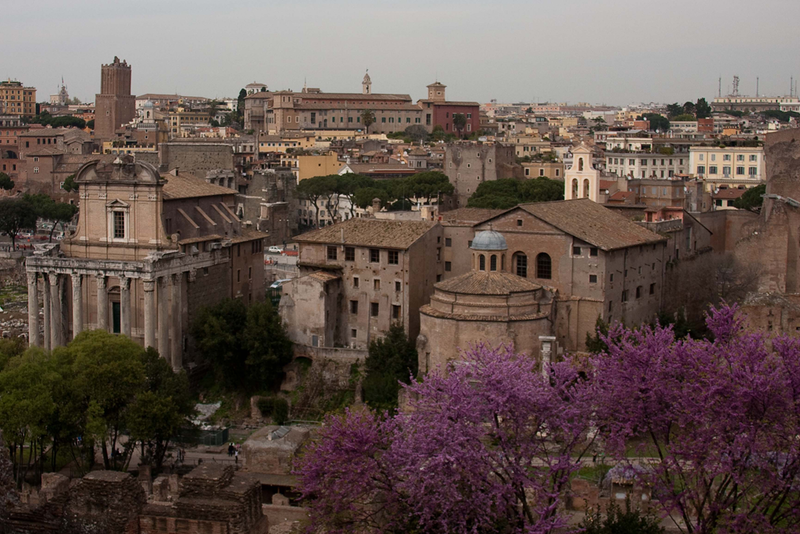 A view of Temple of Antoninus and Faustina (building on the left with the columns) the Temple of Romulus, which is now part of the church of Santi Cosma e Domiano, (the building with the bronze ‘cap’). 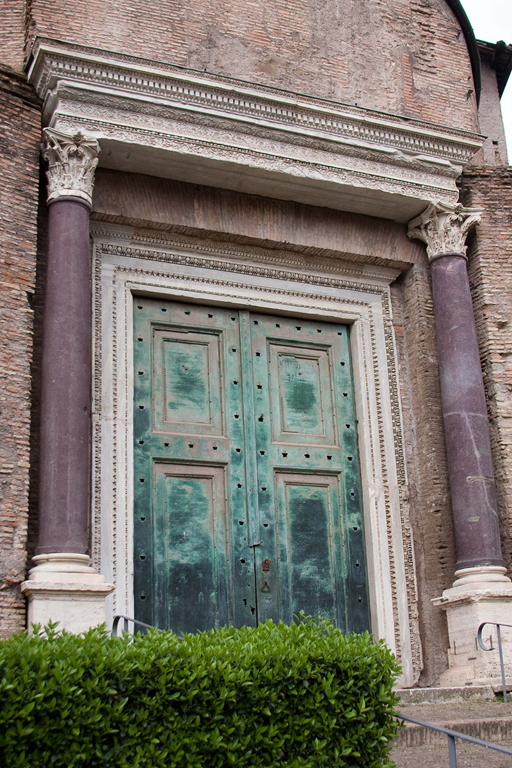 The original 2000 year old bronze doors remain on the temple, which is now a Christian church. The Temple of Romulus was dedicated by Emperor Maxentius to his son Valerius Romulus, who died in 309 and was rendered divine honours. It is possible that the temple was in origin the temple of “Iovis Stator” or the one dedicated to Penates, and that Maxentius restored it before the re-dedication. The ancient Roman fabric was Christianized and dedicated to Sancti Cosma et Damiano in 527, when Theodoric the Great, king of the Ostrogoths, and his daughter Amalasuntha donated the library of the Forum of Peace (Bibliotheca Pacis) and a portion of the Temple of Romulus to Pope Felix IV. The pope united the two buildings to create a basilica devoted to two Greek brothers and saints, Cosmas and Damian, in contrast with the ancient pagan cult of the two brothers Castor and Pollux, who had been worshipped in the nearby Temple of Castor and Pollux. The apse was decorated with a Roman-Byzantine mosaic, representing a parousia, the Second Coming of Christ at the end of time. 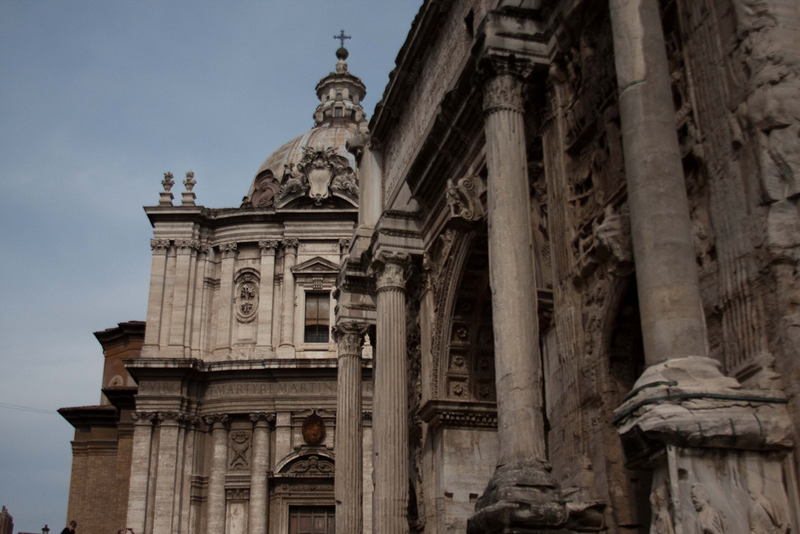 The bodies of Saints Mark and Marcellian were translated, perhaps in the ninth century, to this church, where they were rediscovered in 1583 during the reign of Pope Gregory XIII. In 1632, Pope Urban VIII ordered the restoration of the basilica. The works, projected by Orazio Torriani and directed by Luigi Arrigucci, raised the floor level seven metres, bringing it equal with the Campo Vaccino, thus avoiding the infiltration of water. Also, a cloister was added. The old floor of the basilica is still visible in the lower church, which is actually the lower part of the first church. In 1947, the restorations of the Imperial Forums gave a new structure to the church. 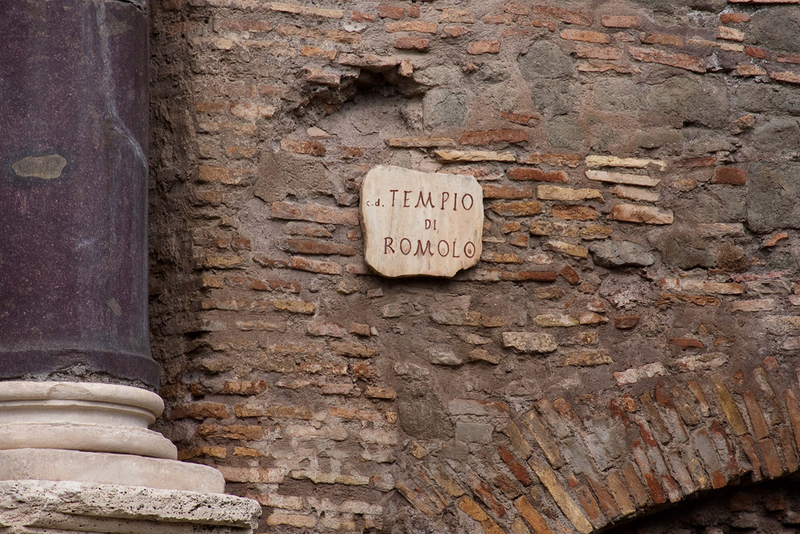 The old entrance, through the Temple of Romulus, was closed, and the temple restored to its original forms; with the Pantheon, the Temple of Romulus is the best preserved pagan temple in Rome. 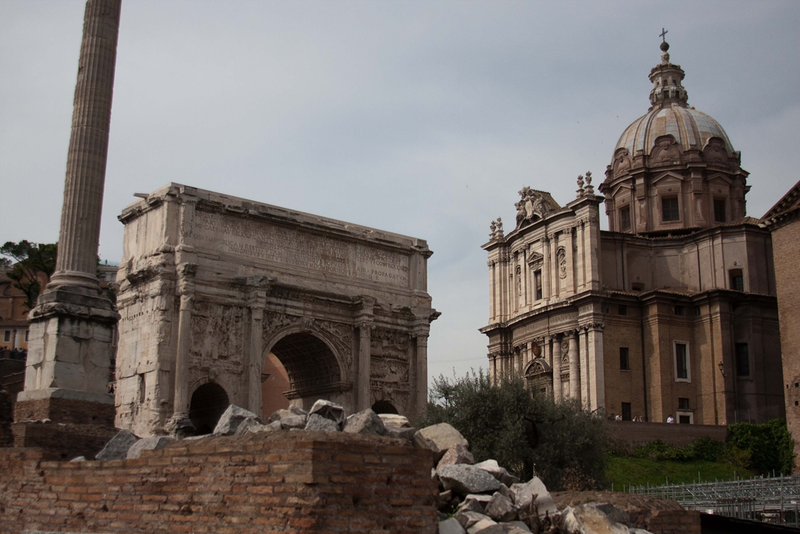 A new entrance was opened on the opposite side (on via dei Fori Imperiali), whose arch gives access to the cloister, and through this to the side of the basilica. I pose the question again, is it right to have a Christian church in a building that was built for a pagan god? Not sure. The grounds were beautiful in April, the wisteria in full bloom. Inside the Curia (the ancient Roman Senate house that was reconstructed) were the sculptures of previous rulers. 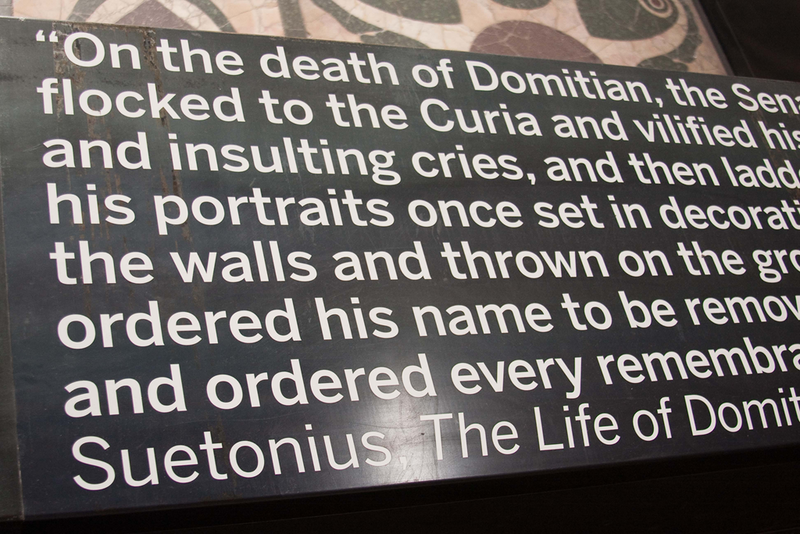 The below was a fascinating piece of history (excuse the clumsy clipping together) on the life of Titus Flavius Domitianus (24 October 51 – 18 September 96), known as Domitian. As emperor, Domitian strengthened the economy by revaluing the Roman coinage, expanded the border defenses of the Empire, and initiated a massive building programme to restore the damaged city of Rome. Significant wars were fought in Britain, where Gnaeus Julius Agricola expanded the Roman Empire as far as modern day Scotland, and in Dacia, where Domitian was unable to procure a decisive victory against king Decebalus. Domitian’s government nonetheless exhibited totalitarian characteristics. As emperor, he saw himself as the new Augustus, an enlightened despot destined to guide the Roman Empire into a new era of Flavian renaissance. Religious, military, and cultural propaganda fostered a cult of personality, and by nominating himself perpetual censor, he sought to control public and private morals. As a consequence, Domitian was popular with the people and the army but despised by members of the Roman Senate as a tyrant. Domitian’s reign came to an end on 18 September 96 when he was assassinated by court officials. The same day he was succeeded by his friend and advisor Nerva, who founded the long-lasting Nerva-Antonine dynasty. After his death, Domitian’s memory was condemned to oblivion by the Roman Senate, while senatorial authors such as Tacitus, Pliny the Younger and Suetonius published histories propagating the view of Domitian as a cruel and paranoid tyrant. Modern history has rejected these views, instead characterising Domitian as a ruthless but efficient autocrat, whose cultural, economic and political programme provided the foundation of the peaceful 2nd century. To work so hard to create a cult like personality to have it all ripped down and to be vilified for the rest of human time thanks to inscriptions like the below. Had they only known. According to Christian legend, St. Peter and St. Paul were imprisoned here. They are said to have caused a spring to bubble up into the cell, and to have used the water to baptize two prison guards. The prison was in an old cistern with access to the city’s main sewer. The lower cell was used for executions and corpses were thrown into the sewer. This entry was posted in Travel and tagged Arch of Septimius Severus, Basilica of Constantine and Marxentius, Italy, Marmertine Prison, Roman Forum, Rome, Santa Francesca Romana bell tower, Temple di Romolo by michaelweening. Bookmark the permalink.